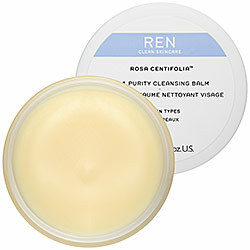 Ren skincare’s Rosa Centifolia No. 1 Purity Cleansing Balm. This is my new favorite night time face wash. It is a rose infused cleansing balm. It starts out like a coconut oil consistency, you rub it between your hands and it turns to a think oil. Then massage for 1-2 minutes. When you apply water it gets milky, and then the final step is to remove with the included muslin cloth. My skin feels so clean and soft when I’m done. It even removes the blackest of black eye makeup. So be the balm and use it to….